For the majority of buyers and tenants upstream, living by the river is all about fully experiencing and embracing the lifestyle, so moorings are coveted here. The tight-knit sense of community this part of the River Thames provides often means that our buyers already live here, but are looking to upsize or downsize. People move here because they love the lifestyle, including boating, rowing, running or cycling along the Thames and discovering homely riverside pubs. Our upstream offices cover the sales and lettings of properties from iconic Windsor, the pretty village of Wraysbury, bustling Staines-upon-Thames, commuter-favourites Runnymede and Egham, affluent Weybridge, market town Walton-on-Thames, family friendly Chertsey, suburban Shepperton, laid-back Sunbury, historic Hampton and rowing paradise Molesey, to Kingston, home to fantastic shopping centres, great restaurants and top schools. Over 12,000 boats a year pass our Waterview office at Thames Ditton Marina, which covers properties along the river throughout Surrey and into Berkshire. We regularly have a variety of riverside property for sale or to let, including flats and apartments in a number of award-winning developments. View a selection of riverside developments upstream. With Waterview offices in Hampton, Isleworth, Kingston, St Margarets, Sunbury, Surbiton, Teddington, Thames Ditton and Twickenham, we truly have this section of the River Thames covered. For almost 1,000 years, Windsor has been at the heart of the British monarchy. Home to Windsor Castle, originally built in 1070 by William the Conqueror, it is the oldest and largest inhabited castle in the world. St George’s Chapel, within the castle precincts, was built in the 14th Century and is regarded as the finest medieval Gothic church in Britain. Windsor Bridge links Windsor with Eton, quaint and full of antique shops and independent cafes, as well as arguably the most famous school in the world, having educated 19 British Prime Ministers. From the Thames, visitors to Windsor can enjoy a view of Windsor’s Home Park, an exclusive section of the famous Windsor Great Park. 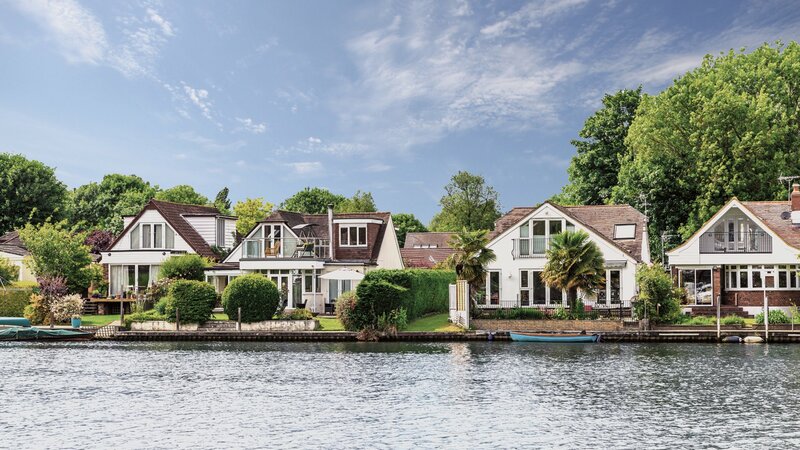 Between Windsor and Staines-upon-Thames sits the pretty village of Wraysbury, home to a wide range of large properties overlooking the river. Commuters benefit from the two railway stations, Wraysbury and Sunnymeads, which offer easy access into London and major towns in both Berkshire and Surrey. The exact site of where Magna Carta was signed in 1215 remains a mystery, but the meadows beside the Thames at Runnymede is the general consensus. The Magna Carta was the first recorded attempt in history to establish basic human rights and forms the basis for the constitutions and statutes of every country in the English-speaking world. To think it all began here in unassuming Runnymede! Hidden from the river by willows, the village of Laleham is immediately downriver from Staines-upon-Thames. Its name means “land in a river bend,” and, from Laleham, the river runs through a flat landscape with reservoirs on the left and meadows on the right, as far as Chertsey Bridge. Shepperton is a beautiful town close to the River Thames, famous for its film studios and productions. The church square in Old Shepperton has many listed buildings including St Nicholas' church. The traditional high street offers a mix of high street brands and independent shops. Hampton Court Palace is one of only two surviving palaces out of the many owned by King Henry VIII. The sixteenth century astronomical clock on the gatehouse to the inner court, helped calculate high and low water on the river. Hampton Court Park is open to the public and is home to the annual flower show. “Kings’s Town’s” royal heritage dates from 838 AD and the Coronation Stone can be found here; the earliest throne of England, on which the first seven Kings of England were crowned. With a footpath running along the banks and Richmond Park nearby, walking, running, cycling and water sports are all on your doorstep here. With great schools, a good mix of period houses and trains only 30 minutes to Waterloo, the area is popular with families and professionals alike. Teddington Lock is where the river becomes tidal. Some of the best schools in the country can be found in Teddington, along with beautiful period homes and a great high street with a strong sense of community. Families love that Royal Bushy Park and the River Thames are both closeby. Strawberry Hill is popular with students as it is home to St Mary’s University, the oldest Roman Catholic university in the United Kingdom. Strawberry Hill itself is named for one of the most impressive houses on the Thames; built in the mid-1700s by Horace Walpole, Strawberry Hill House and garden has been open to visitors for over 250 years. A short stroll along the river in Twickenham will bring you to green open spaces and historical buildings such as York House, Orleans House and Marble Hill House. Twickenham is of course most famous for being the home of English rugby, but Eel Pie Island, which can be reached from Twickenham via footbridge, is more important to those who prefer rock music to rugby. In the 1950s and 1960s, Eel Pie Island Hotel was a popular concert venue, hosting shows by the Rolling Stones, David Bowie, Eric Clapton, The Who and Pink Floyd.